This time last year, I was swallowing cough syrup by the bucket load in a successful attempt to get my singing voice back. After months of hard training with the Military Wives and Gareth Malone, the world famous BBC Proms was about to start. My voice had disappeared to a croak and I was worried I’d miss out on singing in Prom 22 at the Royal Albert Hall 2014. What was the reason behind the War Horse Prom last year? 2014 marked the centenary of World War One. As part of the commemorations, Gareth Malone worked alongside the Military Wives Foundation and BBC Radio 3 to create a spectacular concert in tribute to those who lost their lives. The War Horse Suite, written by Adrian Sutton was performed alongside life size puppets from the National Theatre. The writer, Michael Morpurgo also took centre stage as he watched his story unfold. Here’s a snippet of a two-part BBC documentary which tracked our progress from selection, right up to the big day. 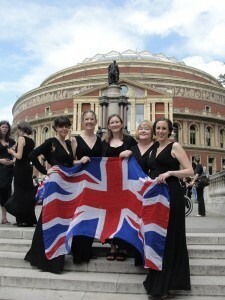 What did singing at the Royal Albert Hall mean to the Military Wives? Standing bare foot on stage, we represented all those women who waved their men off to war with hope and fear in their hearts. We’re military wives, we all know what it’s like to be the one left behind. It was a poignant moment. There is something truly magical about singing together as a choir and creating a sound none of us thought possible. We were all overwhelmed with happiness and pride by the end and felt incredibly lucky to be part of such a special event. It will remain one of the most treasured moments of my life. Was there a selection process in order to sing at the Prom? In 2014, the Military Wives Foundation was made up of over 2000 women and 72 different choirs. Those who wanted to were given the chance to audition for a place in the Prom choir, which consisted of 100 ladies. It involved memorizing a tricky sequence of notes, which had to be sung back with no accompaniment, followed by a few lines from two different songs. Our auditions were all done electronically. Most of us used our phones to record the footage before sending the file, along with our application forms off to Gareth Malone for a decision. What songs did you sing? We started high up in the gods – a group of ghostly voices singing the chorus of ‘Only Remembered’ by Adrian Sutton. We then filed onto the stage, some of us carrying pairs of military boots, which were piled up to represent the mass grave of those who never came home. The gun fired and leaves began to fall as we sang ‘Home They Brought Her Warrior Dead’, by Gustav Holst. Snowflakes appeared to fall from the auditorium as we sang ‘The Snow’ by Elgar. We threw bunches of blue bells into the auditorium after tackling the most challenging song in the repertoire – ‘Ave Maria’, by Gustav Holst, written in eight parts and sung unaccompanied. That for me was the moment I wanted to bottle and keep forever. A group of women praying to the Virgin Mary, accepting their loss and looking to the future with hope in their hearts. We also had the privilege to sing Henry Wood’s ‘New War Hymn’, which was written at the time and never sung. We finished the concert with ‘It’s a long way to Tipperary’, which we sang in French, German and English with Gareth Malone strumming away on the banjo. At first, we spent much of our time meeting up for regional rehearsals, getting to know our parts in smaller groups of about 30 women. We bobbed in and out of each other’s houses, snatching a few moments here or there. We spent hours singing in the shower, on the drive to work or at the sink washing up. By the end even my dog could howl in tune! It was only later that we got together on mass to sing. We met at RAF Brize Norton and surprised the troops coming back from Afghanistan with a rendition of ‘The Snow’. What’s it like performing with Gareth Malone? There really are very few people who can hold the attention of 100 women and stop them talking when they get together, but Gareth kept us all spell bound from start to finish. A miracle in itself! The Military Wives have enjoyed the most spectacular musical journey over the last few years. Gareth Malone has been with us from the start and remains Patron of this incredible charity. He’s a true inspiration and continues to give us the confidence to sing out and be heard.